Mid and lighter weight denim, twill, and nylon jackets from Dickies, Carhartt, Wrangler, and Dutch Harbor including the popular Dickies Eisenhower jacket in both lined and unlined versions. Water repellent breathable styles from Dickies, Carhartt, and Dutch Harbor. Denim jackets from Wrangler and Dickies. From durable cotton duck to water resistant nylon insulated bibs and coveralls from Dickies & Carhartt will keep you warm and dry in the harshest weather. They all feature rugged construction, a choice of colors and a full range of sizes including Big and Tall. Tool pockets, hammer loops, pockets with or without zippers or snaps, these products make being on the job easier and more comfortable. Hooded and crewneck sweatshirts from Dutch Harbor, Dickies, and Carhartt. Great for layering under a coat or jacket. Thermal lined sweatshirts for colder weather. Budget priced sweatshirts and sweatpants from Fruit of the Loom and Jerzees. Hooded coats and jackets from Carhartt and Dickies in rugged cotton duck or water resistant nylon to keep you warm and dry in the coldest weather. 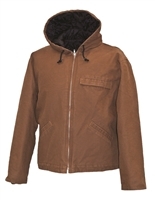 Work coats and jackets from Carhartt and Dickies. Vests in cotton duck, nylon, or canvas for layering. 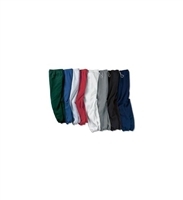 A traditional favorite, these sweatpants are made with a comfortable 8 oz. 50/50 cotton poly blend fleece. Covered elastic waistband and elastic leg openings with inside white draw-cord. No side seams or pockets. Nine colors in sizes from S-XL. The Extremes Coat from Carhartt is water repellent, and has a Cordura nylon shell for longer wear with an arctic weight polyester lining. The Carhartt Duck Vest is our most popular work vest. This zip front duck vest has arctic weight polyester insulation, two large front pockets, and an inside pocket with hook & loop closure. Longer tail for added coverage. Black or Carhartt Brown in regular and tall sizes to 5XL. The Hooded Extremes Arctic Jacket adds a quilt lined hood and is a slightly shorter waist length water repellent jacket. Our most popular winter jacket. The Carhartt Hooded Duck Jacket has quilted flannel lining in the body and quilted nylon sleeve lining to keep you warm and comfortable. Made from heavy 12 oz. ring-spun cotton duck it also has a drawstring close hood, rib knit cuffs and waistband, and two large front pockets. Heavy duty brass zipper and two inside pockets. Available in big and tall sizes to 5XL in Black, Carhartt Brown, Dark Navy, or Red. The Cadillac of traditional duck work coats. The Carhartt traditional duck work coat features heavy 12 oz cotton duck, heavy duty zippers and front chest and waist pockets with two additional inside pockets. Nylon lining quilted to Arctic weight polyester insulation. Triple stitched seams for added durability. Pleated elbows and bi-swing back for ease of movement and durability. If you do a lot of work outdoors in cold weather this is the coat you want. Available in traditional Carhartt Brown or Black in big and tall sizes to 5X. Big Man's Rigid Duck Chore Coat in 3X-TALL Dickies Diamond Quilted Jacket has Dickies DWR water resistant and repellent finish to keep you dry. This is warm and lightweight vest with a rib knit collar and two front hand warmer pockets. Dickies Lined Eisenhower Jacket is one of the most popular long time items in their line. It features waist length adjustable tabs, slash front pockets, and a pencil pocket on left sleeve. Lining is a nylon taffeta quilted to polyester foam. Dickies Insulated Bib Overalls elastic waist inserts allow free movement and shoulder straps have an elastic back for strength. Heavy duty brass zippers with large pulls zip to waist for easy on/off. Bi swing back and elastic waist. The Jerzees Kids Sweatpants have all the same features as the adult version. Covered elastic waistband and elastic leg openings with inside white draw cord. No side seams or pockets. Five popular school colors in sizes from S-XL. Fabric: Shell: 100% hand washed cotton; Lining: 6oz quilted polyester insulation.